July and August are the big holiday season in France and for many who take their time off in August, the criteriums are a chance to see the riders from the Tour on parade. The same is true across Europe, there are special post-Tour criteriums in Belgium, Holland and Denmark too. The typical criterium takes place on a three or four kilometre circuit to be done many times, typically the race is 80km and has a field of about 40 riders. You’ll find Tour stars, local pros plus a handful of local amateurs to help make up the numbers and provide some local flavour. Some riders can really top up their pay with these races. The organisers often have large budgets and spend a large share of their money on appearance fees, paying the likes of Mark Cavendish and Sylvain Chavanel big money to show. Riders see their value determined by the Tour performances, if their name is big enough to draw the public to the race then the organiser will cough up, often €50,000 for a two hour race. In return sometimes access to the race is by ticket only: 25,000 fans paying €5 and the money soon adds up, plus there’s money from local sponsors. Above all, this is a show. It’s common for riders to appear in the Tour de France jerseys, for example Anthony Charteau is going to spend August lapping France wearing his polka-dot jersey, recreating moments from the Tour and allowing the public to recognise the riders they saw on TV. I’ll whisper this but the result is almost always fixed in advance. 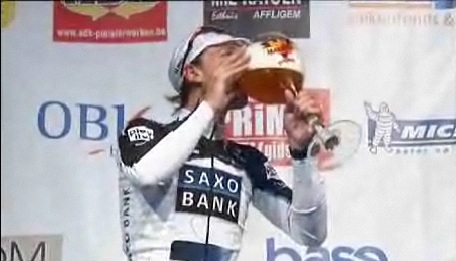 The other night in Aalst saw Cancellara “drop” the bunch with Petacchi winning the “sprint”. And I’m pretty sure you’ll see a criterium in France where Chavanel clips off the front to “deny” Cavendish the win. In short the aim is to give the public what they want. It’s showbiz instead of sport. One rider who didn’t stand for this was Bernard Hinault. Even as an amateur the fiery badger didn’t want to be outclassed by riders from the Tour de France and caused a lot of trouble when he started dropping established pros who were expecting an easy ride and a fat envelope of cash. Sastre beats Cav and Freire! LOL!